Continuity! On the note of the Dededoll, a few people predicted (asked?) that the Dedede cup from the last comic would be made into real merch. 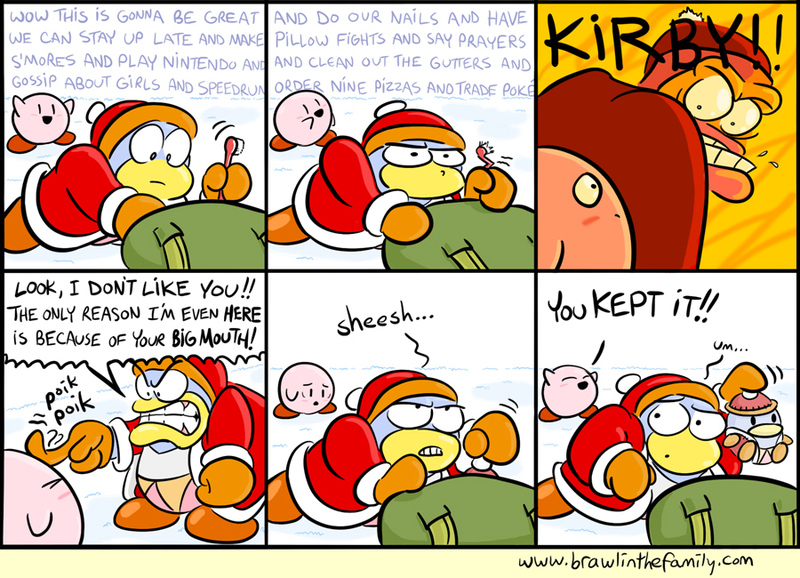 But in reality, it’s just a remnant from Waddle Dee’s character page, and a sign of Dedede’s self-centric style of living. Who wouldn’t want to drink fluid from a receptacle in the shape of their own head? Besides, I’ve got my hands full with a different major piece of merch anyway! The BitF book is quite close to its next goal, which would bump up the quality of the paper even more, as well as add full art on the inside covers! And beyond that, I’ve listened to the requests and am setting the next goal for hardcover versions of the book! For details, you can check the page. More sleepover shenanigans to follow on Tuesday.